Better cash flow, fewer delinquent accounts, decreased theft, increased energy efficiency and satisfied customers. Smart payment households use 12 to 15 percent less energy. Itron technology connects utilities with 15 million prepayment customers worldwide—learn why we are the global smart payment leader. From prepayment metering devices with keypads and vending systems to AMI-enabled, cloud-based prepayment services, Itron combines cutting-edge technology in the field with unrivaled domain expertise and back office services that span electricity, gas and even water. Smart payment (or prepayment) is the process by which a customer uses energy and utility services following prior payment. Itron offers a full range of smart payment solutions via hardware (prepay meters) or software (smart prepay services). Many of our utility customers view prepayment programs as an increasingly attractive AMI-enabled service option that delivers strong value to both the utility and customer alike. A certified prepayment system in the cloud? We'll make it easy for you. Itron’s cloud-based prepayment services platform — which supports electricity, gas, water and currency credit use — is the first in the industry to be certified by the STS Association, which manages the world’s only globally-accepted open standard for prepayment systems. Working with our technology partners at iPay Ltd., Itron has delivered an STS-certified, global, cloud-based smart payment service offering capable of supporting the smart payment needs of all types of utilities. This is a highly interoperable platform based on open standards and certified to support both currency- and unit-based (KWh, cubic meters, kiloliters) prepayment transactions for all utilities: gas, water, and electricity. Our platform also supports a broad spectrum of smart payment technologies, from keypad meters to smart communicating (AMI) meters equipped with remote switches. Consumers Energy has seen operational and customer benefits from their OpenWay cellular AMI deployment, including recognizing voltage fluctuations, gaining insights into distribution data and detecting outages. Because of the ease and flexibility of the deployment combined with a proactive customer outreach program, Consumers Energy’s customer satisfaction as measured by Net Promoter Score improved by 140%. Smart Meters. Smart Payment. Smart Thinking. If you're using an AMI system with two-way smart meters equipped with remote switches, you have everything you need to start a smart payment program. Itron’s OpenWay Riva IoT solution supports a “thin meter” prepayment model where the tariff is defined in a third-party prepayment software solution and no additional hardware is required at the customer premise. OpenWay Riva residential meters provide the two-way, real-time communications, usage data and robust security required for remote disconnect and reconnect of service. This includes the ability to automate load-limiting based on thresholds. 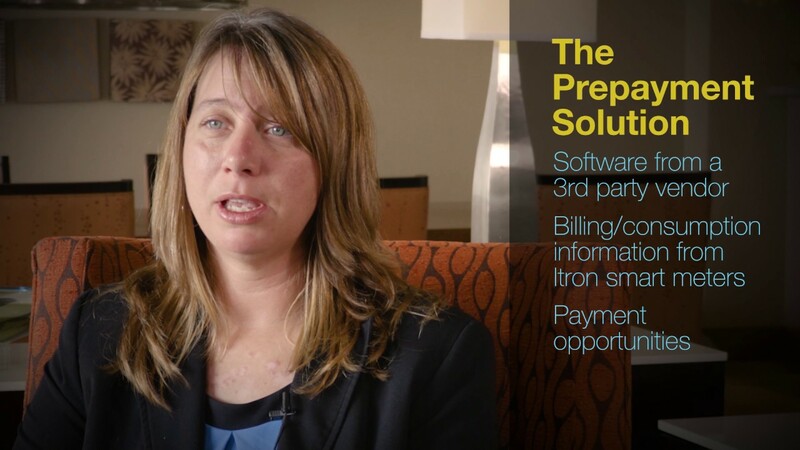 Itron’s prepayment solution also provides customer enrollment, payment methods, billing system synchronization, low balance and disconnect alerting. This solution also enables consumers to better understand their energy usage through a variety of interfaces. Itron offers this services-based prepayment solution in partnership with a number of industry-leading partners, including PayGo and Exceleron, both of which we have worked with in North America to deliver successful prepayment solutions to utilities on the OpenWay Riva solution.